Triumph Motorcycles UK is preparing to launch a whole new range of models under its new Triumph Factory Custom (TFC). The first of these will be the 2019 Triumph Thruxton R TFC. Images of the new motorcycle have been leaked and it sure looks impressive. 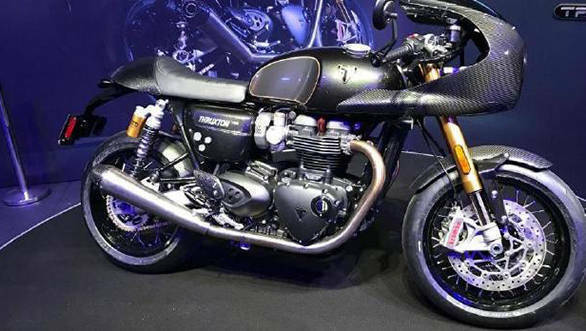 The images come from an international dealers' conference in October where Triumph had showcased the Thruxton R TFC. Earlier this month, some spy shots of it undergoing testing had also surfaced. The Triumph Thruxton R TFC is likely to be unveiled in January 2019. In a similar manner, images of the upcoming Triumph Rocket III were also leaked from the dealer conference. The TFC version will be a limited edition model with only 750 numbered units to be built. Two TFC models were first shown in 2014, with the aim of inspiring customers to modify their own bikes. New on the Thruxton R TFC is a 10PS boost, taking the power figure to 107PS from the 1,200cc parallel twin. Triumph adds a titanium Vance & Hines exhaust as well as nw engine maps for the riding modes and reduces the overall weight by 4.7kg. 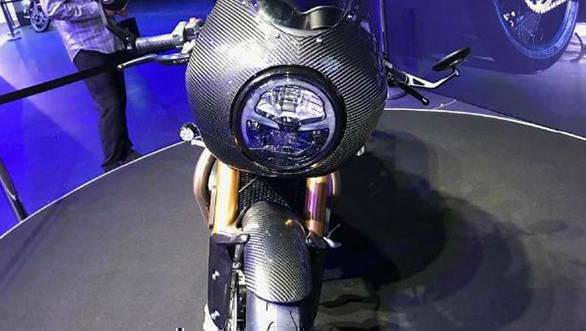 That may be thanks to the new carbon fibre bullet fairing, and the new single seat. The stock Showa suspension has been swapped out for Ohlins NIX 30 front forks, and matching shocks at the rear. There are Brembo radial calipers with matching Brembo radial master cylinder with a new adjustable lever. The shoes match the suit, with the Thruxton R TFC receiving Metzeler Racetec RR tyres now. From the cockpit, you will also see a billet piece on the handlebar top clamp which has the limited edition number of the motorcycle as a reminder of its exclusivity. Triumph intends to build such TFC versions as the range-toppers for all its motorcycles in limited runs.